We are engaged in the manufacturing, exporting a diverse range of Flat Weave Cotton LURIX Durries in Ottoman design. 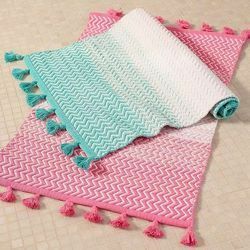 Our company has achieved immense accolades amongst its patrons for successful business in the domain of manufacturing an excellent quality assortment of Cotton Rugs & Durries. Our designs range from traditional ethnic patterns to rural art to more contemporary geometrical designs. These Fancy Jute Durries are offered in various shapes, sizes and color combinations. This product is more durable and compatible in nature and also demanded in domestic market. Customers can be easily grabbed this from the market at attractive prices. Backed by our affluent industrial acquaintance of this field, we are actively involved in presenting an extensive collection of Designer Floor Durries. Cotton Kelim Design Durrie, Size: 43"x72"